The Kansas Energy Office, a division of the Kansas Corporation Commission, administers programs and connects Kansans to objective information about conservation, efficiency, and alternative energy. Funding is provided by the federal State Energy Program. Explore energy saving opportunities you can implement at home, school and in the workplace. 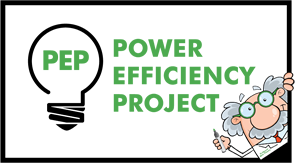 The Power Efficiency Project helps create awareness that translates into efficient usage and costs savings. As Professor Max Powers would say – You have the power to make a difference! Does the State of Kansas have any Grants or Programs available for Energy Conservation? Who do I talk to about a complaint I have with my utility provider? What incentives does the State have for energy efficiency? Where can I get help with my utility bills? Find information about a gas/oil well. Speak to someone about wind energy. Speak to someone about solar energy.